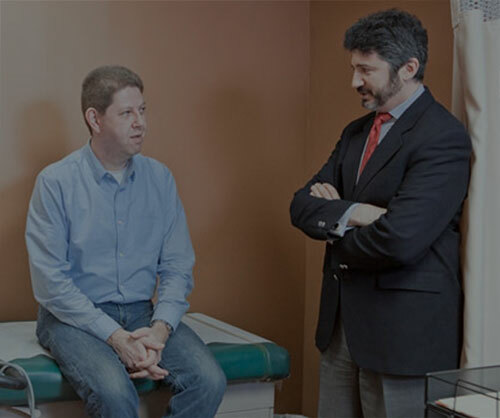 Our board certified physicians treat all major diseases and disorders of the thyroid gland. Your thyroid is a butterfly-shaped gland in your neck, just above your collarbone. It is one of your endocrine glands, which make hormones. Thyroid hormones control the rate of many activities in your body, including how fast you burn calories and how fast your heart beats. These activities make up your body’s metabolism. This occurs when normal cells in the thyroid change into abnormal cells and grow out of control. There are different types of thyroid cancer. Some types are more serious than others. This is when your thyroid gland makes more thyroid hormones than your body needs. This can cause you to feel shaky, anxious, irritable, or tired, experience excessive sweating, irregular heartbeat, or frequent bowel movements. Hyperthyroidism can also cause goiter (see below), can affect a woman’s menstrual cycle and/or fertility, and can cause sexual problems in men. Women who are planning to get pregnant are typically advised to have their hyperthyroidism treated first. Not to be confused with hyperthyroidism (above), this is when your thyroid gland does not make enough thyroid hormones. People with this condition often feel tired, get cold easily, experience coarse or thin hair, and/or constipation. Women can experience disruptions in their menstrual cycle, fertility issues, and/or complications with pregnancy. This is an enlargement of the thyroid gland, which is typically caused by abnormal growth of the gland itself plus one or more growths called nodules (see below). Not all goiters cause symptoms, but when symptoms do occur they may include a visible swelling at the base of the neck or a tight feeling in the throat. Although goiters are usually painless, in some cases the throat/airway can be affected, causing difficulty breathing, coughing, wheezing, or trouble swallowing. These are lumps in the thyroid gland caused by round or oval-shaped growths. These are common and not usually harmful to one’s health. However in some cases nodules can be a sign of a serious condition such as cancer. This is a swelling of the thyroid which results in the gland leaking large amounts of thyroid hormone into your bloodstream, resulting in hyperthyroidism (see above) – this lasts until the hormone is used up, at which point hypothyroidism can occur (see above). Thyroiditis can be caused by autoimmune disorder, pregnancy (called “postpartum thyroiditis”), medications, or infections. Our professional staff is trained to diagnose and treat all major conditions of the thyroid, and we offer several diagnostic tests right in our office, including thyroid ultrasonography, ultrasound-guided fine needle aspiration (thyroid biopsy), and bone density testing (DEXA scan). Test results are always provided promptly and are interpreted by our board-certified physicians, who take as much time as needed to provide a comprehensive patient consultation. For more information, please visit our services page. We provide comprehensive thyroid care for patients throughout Monmouth and Middlesex Counties and all of Central NJ. Book your appointment as a new patient today by calling our centralized scheduling department: 732-705-4232. Our New York patients can contact our Brooklyn (Bensonhurst) location by calling 718-891-8790. We provide flexibility and convenience for our patients with office hours that include evening and Saturday hours.